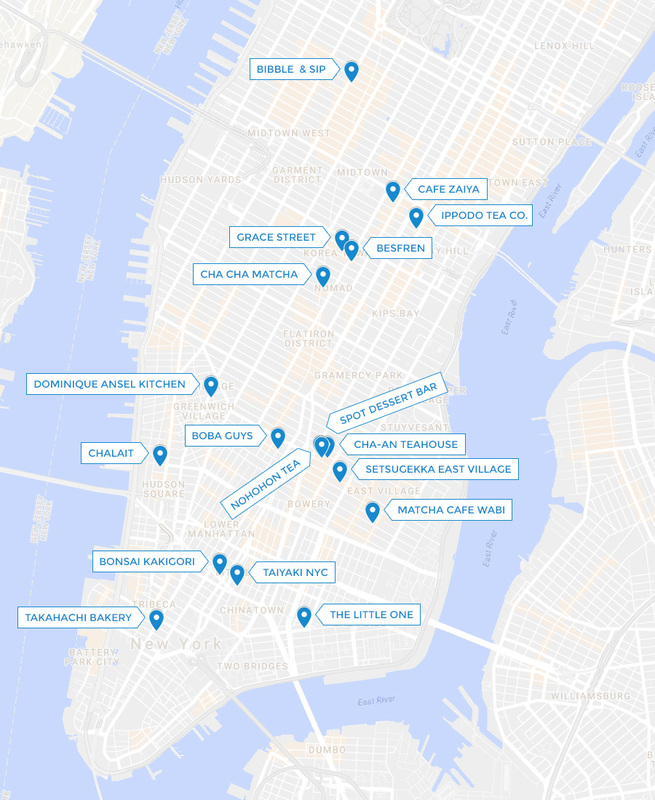 A while back I did a post on 10 Places to Drink Matcha in NYC but with this list, I’m also naming places that serve matcha desserts. And if you want to go beyond matcha tea, I highly suggest going for a guided tea tasting for a refined tea experience. From basic iced matcha lattes to elaborate matcha desserts, my picks are listed from downtown to midtown. Here’s a handy Google map to guide you around town. A Japanese bakery in Tribeca where I like to get their delicious iced matcha latte and grab some savory baked goods and desserts like the rolled matcha crepe. A new dessert shop with Japanese sweets like monaka ice cream sandwiches and matcha shaved ice. Try to stop yourself from getting everything on the menu. You’ve probably seen their fish-shaped waffle cone topped with matcha soft serve ice cream. It’s Instagram heaven. Kakigori is Japanese shaved ice and inside Canal Street Market is where you can get one. It’s hard to pick a flavor since they all look great but the matcha kakigori is pretty damn good. Chalait is all about matcha beverages — matcha Arnold Palmer, matcha hot chocolate, or a matcha latte — they’re all good. I always say I’ll try something new on the savory menu but I always get the Kyoto Salmon Bowl which I’m addicted to. They have three locations but I like the West Houston Street location the best. A tiny cafe deep in the East Village where they do a really good matcha latte made with a heavy cream base. See my visit from a couple of years ago. There’s barely any seating (a small bench) so take your drink to go. Ok, so I’ve tried to go three times and each time it was closed. I kind of gave up on it but putting this list together is reminding me I should go try it out. Keeping my fingers crossed it’s not closed again! 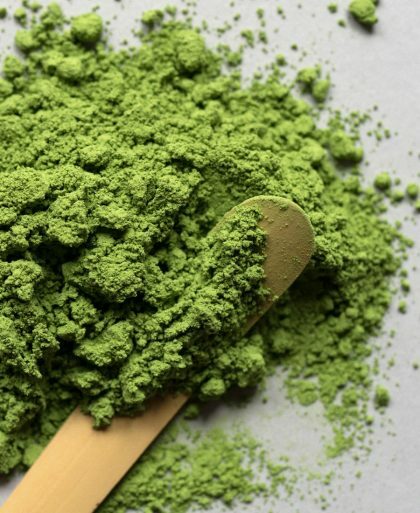 Traditional matcha is prepared by an award-winning tea master. 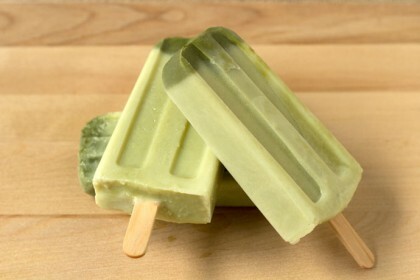 The matcha tasting of three different kinds of matcha caught my eye. A popular Japanese cafe in the East Village I’ve been going to for years. It’s nice and cozy and their matcha desserts are always good. Get the matcha parfait if it’s available. All they do are matcha based drinks in this tiny second floor spot that can barely fit two people inside to order. Add toppings like the red beans and get it flavored with vanilla or hazelnut. Spot Dessert Bar is always filled with high school and college kids looking for a sweet fix. They have matcha based desserts on the menu but I like their “Golden Toast” which is really really good but doesn’t even have a hint of matcha. My favorite place for bubble tea, Boba Guys makes their drinks with house-made syrups instead of powders so you can really taste the difference. Give the pretty Strawberry Matcha Latte a try. 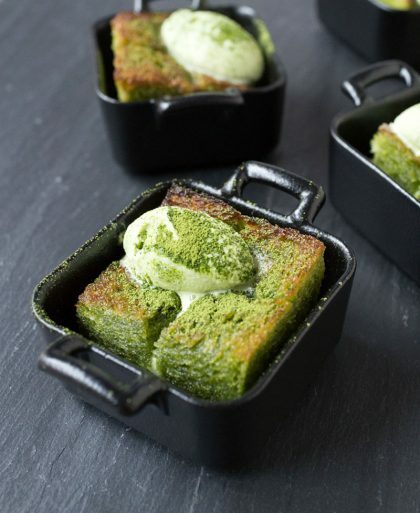 What I get every time I go — Mini Matcha Beignets. Eat it right away when it’s toasty hot! I don’t love their matcha but their marketing and branding is A+. Go and get that Instagram shot. I like Besfren’s matcha and non-matcha desserts and they took it up a level with their matcha and taro soft serve swirl. Grace Street does an interesting milkier version of shaved ice. They call it shaved snow and it’s like shaved ice and ice cream in one. The matcha shaved snow comes with red bean, taro, honey boba, and condensed milk. This place is legit. My go-to place in New York City for matcha, I like their Usucha (thin matcha) but get the thick version, Koicha, to compare. They prepare the drinks in front of you so that’s fun to watch (and learn). Cafe Ziaya near the New York Public Library does a solid matcha soft serve and I think it’s the best in the city. Another favorite there is the mochi doughnut which is my absolute favorite doughnut ever. Famous for their cream puffs, the matcha one is definitely one to make a detour for.